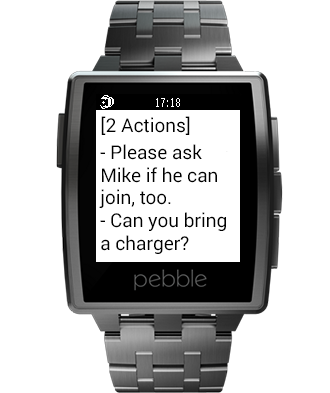 The Pebble can handle plenty of functions thanks to a wide range of third-party apps, but interacting with messages typically remains a passive experience. Naturally, someone had to address this. 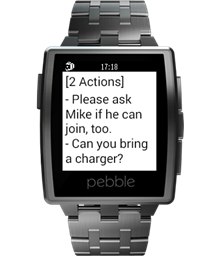 Reqallable, an app that provides smartwatch wearers with the ability to respond to email and text messages without pulling out their phones, has added the Pebble to its list of supported devices. Users must register a reqallable account to get started, and the setup can be somewhat intimidating. That shouldn't be too surprising, though, considering the type of app this is. The end result is something that potentially does away with one of the common criticisms of smartwatches. The app is free to use, and you can get your hands on it via the widget below. MOFFETT FIELD and MOUNTAIN VIEW, Calif., March 27, 2014 /PRNewswire/ -- reQall (www.reqall.com), the award-winning developer of proactive intelligent assistant technologies, today launches reqallable for the Pebble Smartwatch, the first context-aware app to intelligently manage notifications, identify critical information and let you act on what matters most in email and text messages. 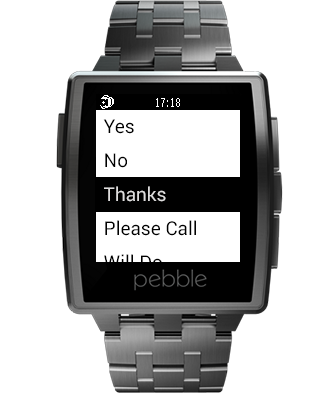 Available now for free in Pebble's smartwatch appstore for Android, reqallable understands where you are, what you're doing and who's important to you to intelligently screen messages, highlight critical details and requests, and let you respond without reaching for your phone. 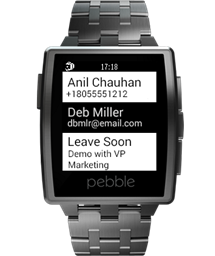 "reqallable expands the utility of Pebble by optimizing your email, text message and notifications experience," said Pebble CEO and founder, Eric Migicovsky. "It's hard to imagine a more transformative interface for a smartwatch than a technology that contextually understands who is important to you, when to buzz you, what to present you at a glance, and permits responses and actions directly from the watch." reqallable automatically determines and prioritizes messages from important contacts based on your calendar, communications, activity and location. For example, if you've scheduled a meeting, reqallable will alert you to messages from participants, temporarily elevating those contacts to VIP status while holding back other messages until the meeting has finished. When a message arrives, reqallable parses emails and texts to present only the most critical details, and even offers pre-formatted responses like "This is fine," "Please call," or "Let's meet," for quick replies. 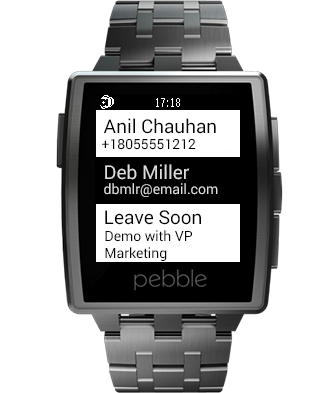 "Pebble users are early-adopters of wearables and view the smartwatch as the next stratum of personal communication tools. reqallable helps Pebble become a more fully-functioning device by managing and modulating when it's a good time – or not – for an interruption, and gives the wearer tools for a quick reply without having to reach for their smartphone," commented Rao Machiraju, co-founder and CEO of reQall. "reQall was founded based on award-winning research conducted at MIT that entailed wearing a device to understand human behavior. 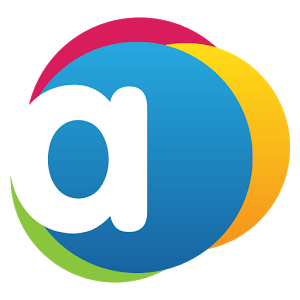 The goal was to intelligently automate personal assistance tasks on behalf of the user: with reqallable, that's exactly what we've achieved." reqallable for Pebble is the third smartwatch app launch for reQall, which introduced reqallable for the Sony Smartwatch in January, followed by reqallable for the Samsung Gear in February. New apps for other devices will be released over the coming months. reqallable is available in beta for Pebble, Sony Smartwatch, all Android phones, and soon will be on Samsung Gear. More information can be found at www.reqallable.com. 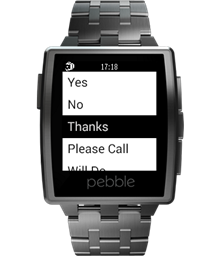 The App can be downloaded at Pebble's AppStore and Google Play.